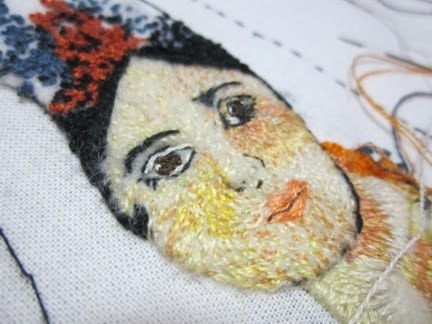 Recently I saw a book called Embroidered Portraits: Ideas, Inspiration and Techniques by Jan Messent on Amazon. Amazon has a "Look Inside" for this book and the portraits are very nicely done. 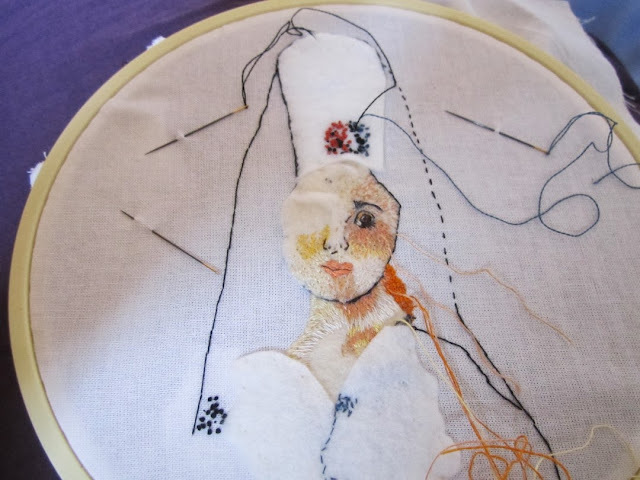 This got me thinking of the Marie Antoinette embroidery that I have been working So I was going to buy the book but I already have so many books. Instead I set myself a challenge to try embroidering a portrait using the knowledge I already had. The first step was to find a portrait that was usable. So I chose a picture by Picasso that I felt could be translated into embroidery. 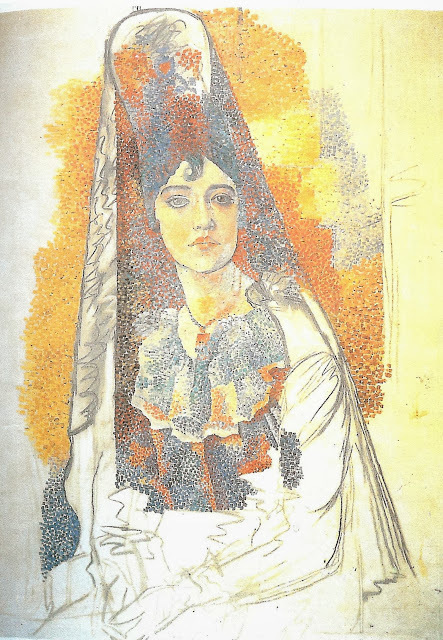 Woman in a Mantilla, 1917 by Picasso. 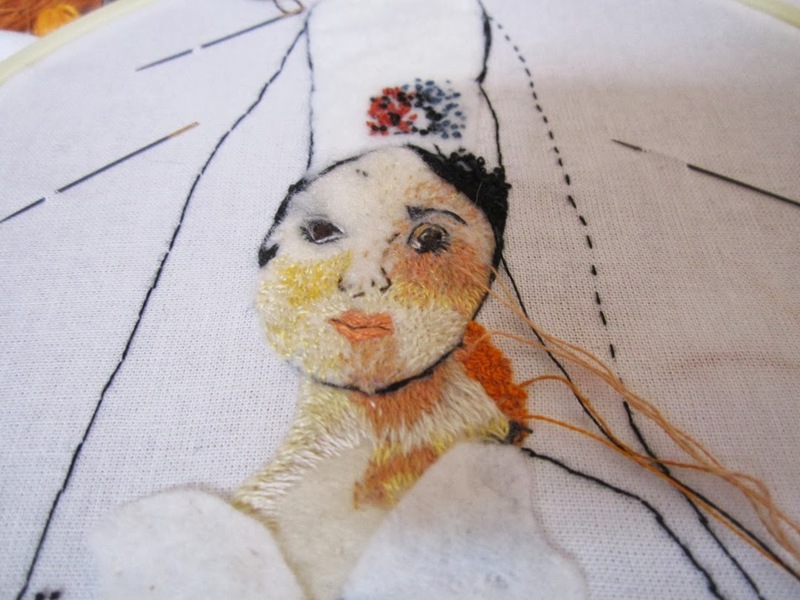 The portrait I chose has a lot of small strokes that could be made out of french knots and small straight stitches in clusters. The colors have been a problem. I have been having trouble matching the picture to DMC floss. So I have tried my best with the colors that were on hand. Finally to add to the complexity I didn't print out the picture or even outline it on the fabric. I tried to imagine using paints and pastels while using a needle. So to do justice to Picasso this project is my interpretation of his work. Hopefully his ghost won't come to haunt me. To start the embroidery I took a medium weight white fabric. Next using the image I free hand cut felt that roughly matched the shapes of the head, ruffle, hair and comb. This was probably my first mistake. Though it does look nice the felt fluff tries to show between the stitches. I read somewhere that using an iron-on interfacing on one side of the felt helps reduce the fluff. But it has been my experience that it is much harder to get a needle through the interfaced felt. So I just made more and smaller stitches catching the fluff to the surface. Woman in a mantilla embroidery after 5 hours of work. In the picture above you can see how I jumped around embroidering the picture. After tacking down the felt I wanted to try different stitches just to make sure the stitches were giving the right feel to the embroidery. I started with the neck doing long and short stitches but I am still unhappy with the sharp color changes. This is something I still have to resolve but I have gone back in with small random stitches to help blend the lines. I worked on the face only when my eyes weren't tired and my hands were steady. Even with care I still had to rework the left eye four times. So after 14 hours most of the face is finished. Or at least the fabric can't take any more stitching! Embroidery after 14 hours of work.